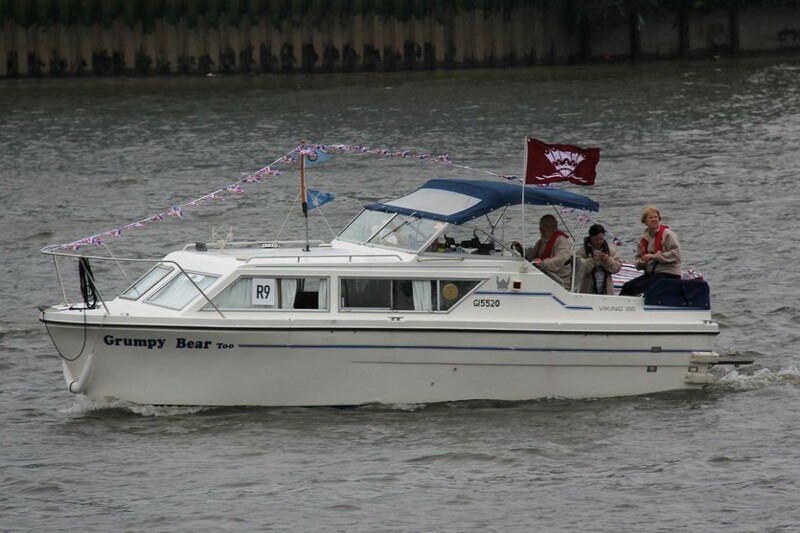 This is our story of Grumpy Bear Too, our Viking 26 Widebeam cruiser and our participation in the Queen’s Diamond Jubilee Pageant. Based at Buckden Marina on the River Great Ouse Grumpy Bear Too is powered by a Honda 35Hp outboard engine. 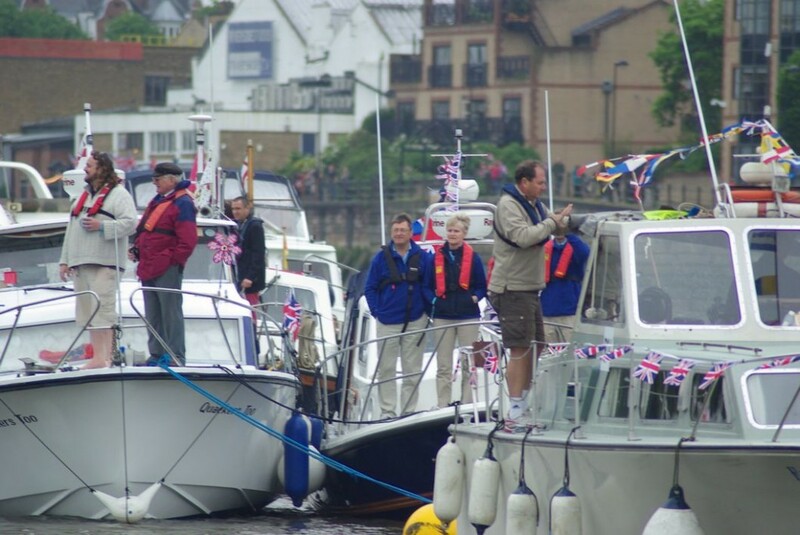 In June 2011 we applied to take part in the Queen’s Diamond Jubilee Pageant, a 1000 boat flotilla through London on the Tidal Thames taking place on 3rd June 2012. Early this year, we were delighted to find out that we had been successful and the planning for our adventure could begin. Firstly, there was work to be done on the boat. Until now, we have used standard portable outboard engine fuel tanks giving us a total capacity of 50 litres with a range, at river cruising speed, of about 100 miles. This would be insufficient for the Tidal Thames as we would have to make 4 complete trips through London without refuelling. We had previously thought about having a larger internal fuel tank fitted (when planning a trip to the Norfolk Broads) – and now was the time to get it done along with the usual routine servicing. 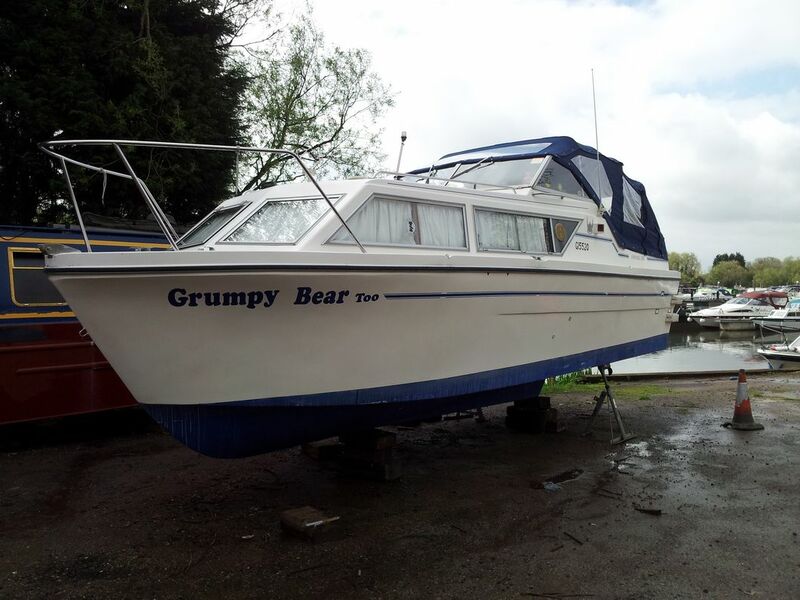 So over the Easter Bank Holiday we moved Grumpy Bear Too from Buckden to Priory Marina in Bedford where the work would be done. She would sit “on the hard” immediately outside Mike’s office at Walton Training, where work in progress could be monitored . The engine would also get a good service, and the hull cleaned and polished. A clean of her bottom and a new coat of antifoul paint would finish off the operation. 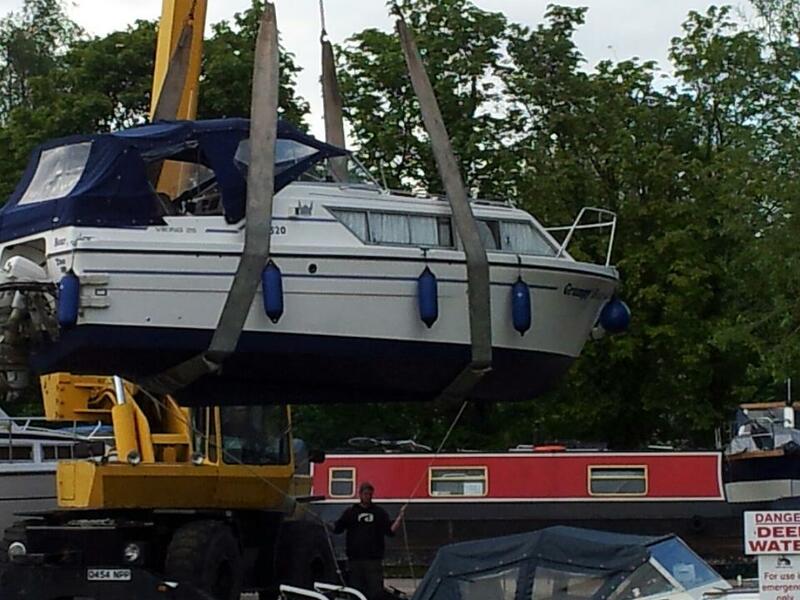 There was also the small matter of getting the prepared boat to the Thames. 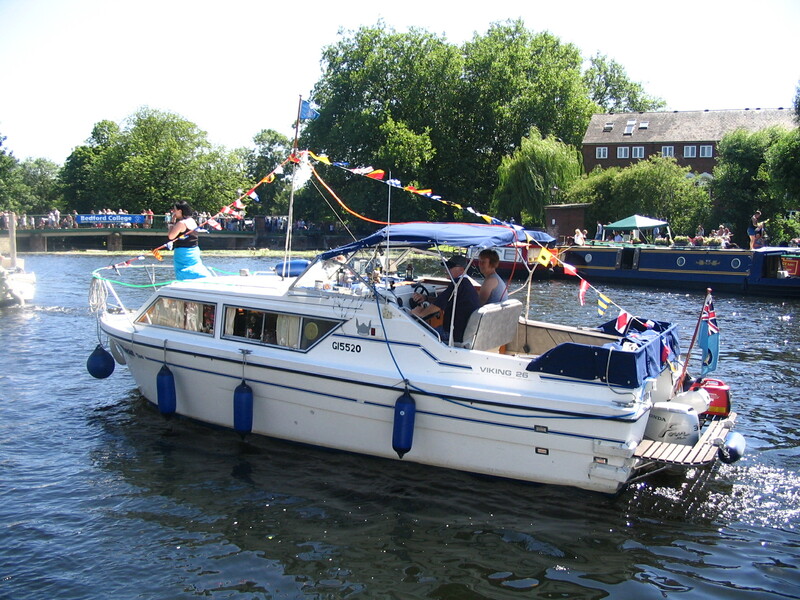 However, we have done this before so it was an easy choice to contact David at Riverside Marine and Leisure based at the Pike and Eel Marina, Needingworth, Cambs who had served us so well previously. 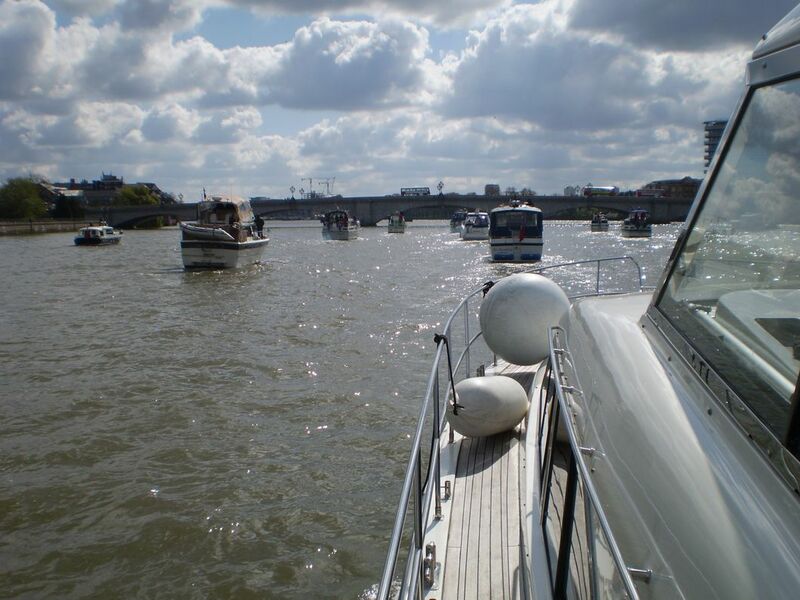 We booked our transport for Friday 25th May which would give us 6 days pleasant cruising down the Thames to West India Dock (on the Tidal Thames near “The Dome”) where all participating boats have to be inspected by the Port of London Authority and the Met Police. 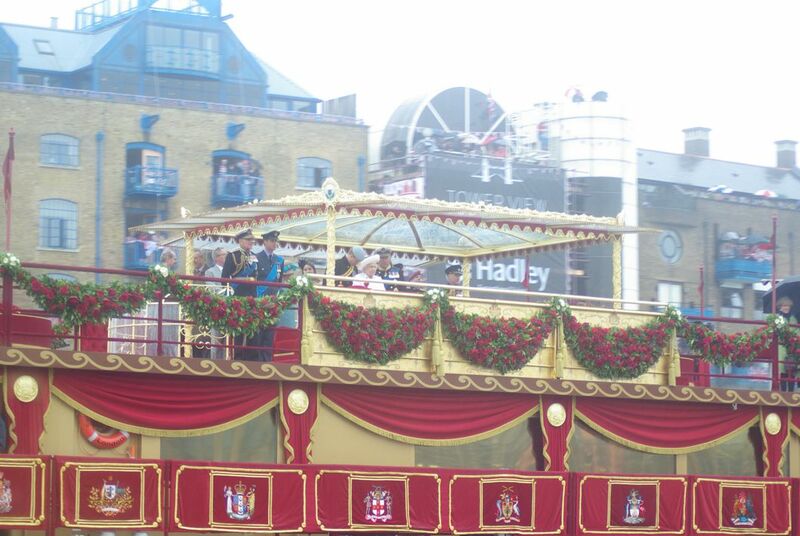 the full story of our participation click on “Queen’s Diamond Jubilee Pageant” is detailed in our regular blogs below. As the tale unravels you will see that the plan did indeed come together. 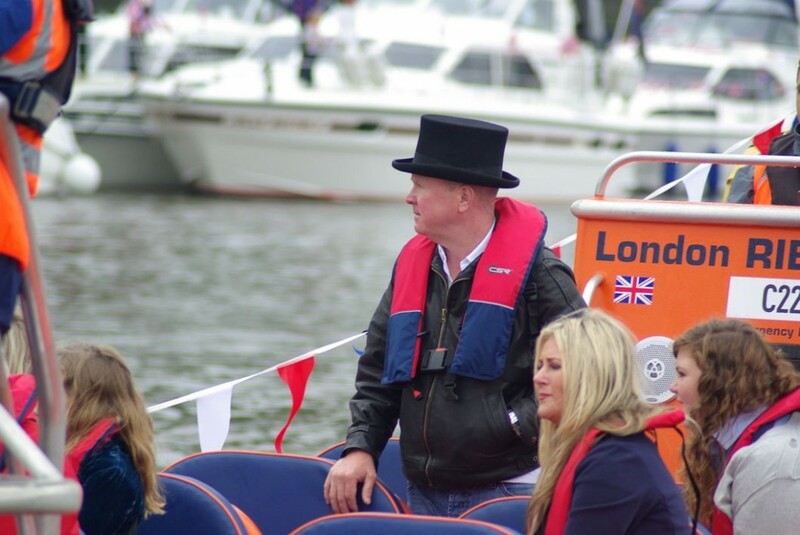 In particular, the service provided by both Riverside Marine and Leisure, and Benson Waterfront, at both ends of the holiday, was faultless in every way. Everybody taking part in the pageant has to attend a rehearsal to get an overview of the route and the hazards including bridges along the way. As we could not get Grumpy Bear Too to London for the weekend we were allocated places on another participants boat – and what a nice boat it was too, a Broom 44. Fiona and I decided to make a weekend of it staying in London overnight on the Saturday so that we could hit the shops and do the sights. Then, we were up early on Sunday morning to be at Imperial Wharf Pier for an 0830 briefing and to embark on our host’s boat. We would follow the pageant route from Richmond to just beyond Tower Bridge, completing various manoeuvres on route including an emergency stop. 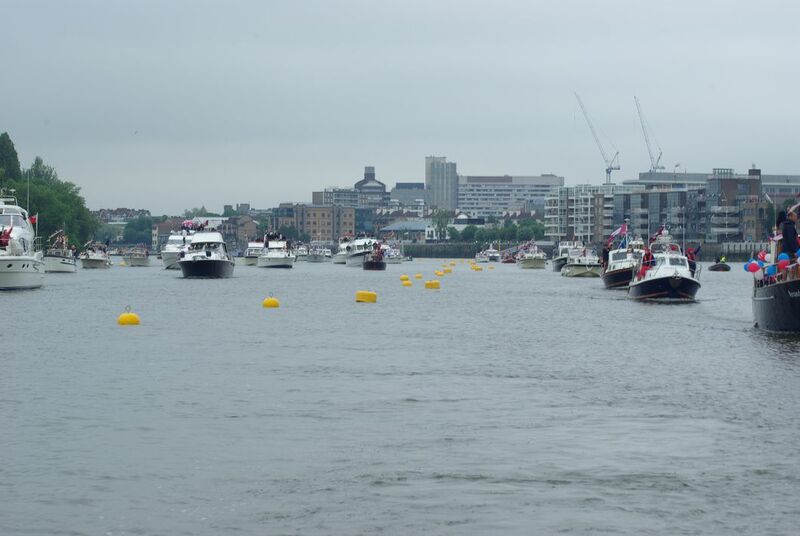 We also got to see the temporary mooring buoys being put in by the Port of London Authority where we will moor overnight on Saturday 2nd June immediately before the pageant. The rehearsal went very well; it was great fun going through London 4 abreast through the bridges led by the Port of London Authority Harbour Master on the lead boat. The emergency stop procedure was very entertaining – lets hope we don’t have to carry it out on the day. Work is progressing well. The engine has been serviced and just requires “in-water” testing. The hull has been cleaned using a gelcoat paste and “elbow grease”, and then polished with gelcoat polish with the aid of the “Halfords” electric car polisher. Work continues – albeit slowly – on fitting the inboard fuel tank. There is just enough space to fit a 93 litre tank and its associated fittings, but the working area is very confined. The installation must fully comply with the requirements of the “Boat Safety Scheme” – the boating equivalent of an MOT, and of course we don’t want petrol leaking in the boat!! There will also be a fuel gauge on the instrument panel so wiring has to be run through the boat to the dashboard. The tank fitting is more easily finished with the boat back in the water. 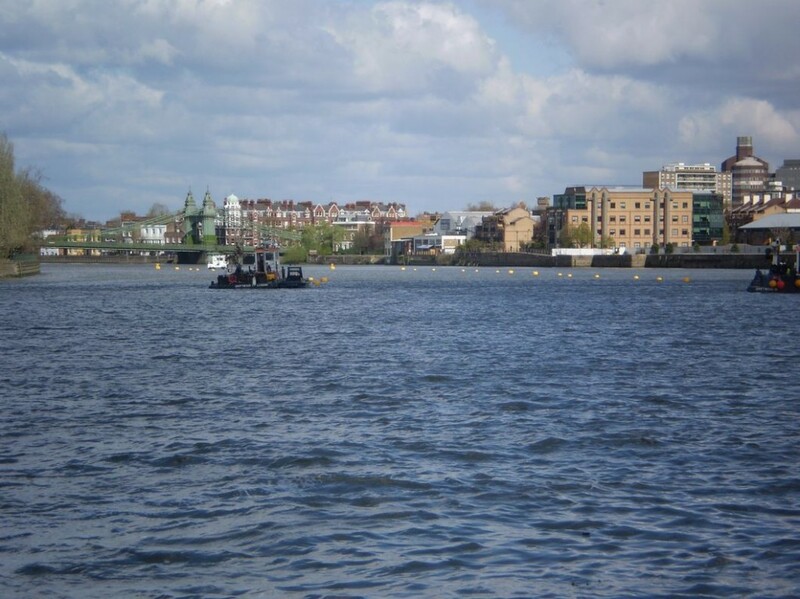 The antifoul paint – to prevent barnacles etc sticking to the bottom – which must be suitable for the salty tidal Thames as well as fresh river water, will be applied immediately before the boat goes back in the water. So the big day has come and Grumpy Bear Too has been successfully craned in with nice new antifoul paint on her bottom. I always take a deep breath when I see her being swung around high in the air. Lots of work now needed to finish the fuel tank installation ready for us to proceed down river back to Buckden on Saturday morning. Fingers crossed. The plan is for Grumpy Bear Too to be transported from Buckden to the Thames by road on Friday 25th. She will go in at Benson Waterfront giving us 6 days to get to West India Dock. That will be a nice gentle cruise. Very excited now! Well, after a bit of a delay on Saturday morning because the workshops had not finished proving the fuel tank, we had a very pleasant trip down river staying overnight at a favourite mooring at Lamas meadow in St Neots. Talk about taking it to the wire. Was a bit Grumpy I have to say 🙂 However, events were to prove later, that we could not have done the trip without the new fuel tank. Met up with an old friend who was out coaching the rowers. An earlyish start on Sunday morning saw us back at Buckden by midday. Now we have a few days to get her clean and shipshape ready for the Thames on Friday. Never realised there was so much to clean 🙂 We also need to get the very important Jubilee regalia on board so that we look the part in the pageant. 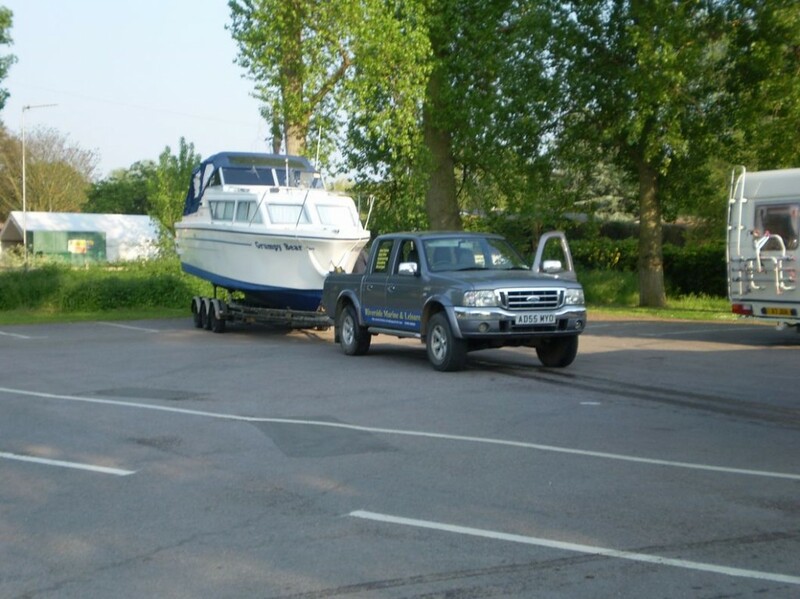 Yesterday saw Grumpy Bear Too slipped out onto the trailer by “Riverside Marine and Leisure” ready for an early morning trip to Benson Waterfront. The trip went smoothly without a hitch, so that when we arrived at Benson mid-morning Grumpy was safely in the water. Once again we were met by the very friendly and efficient staff from “Benson Waterfront” who helped us out with car parking for two weeks, and the details of the return pick up. I have to say that our stay at Windsor was rather noisy. The disco boats ferrying partygoers to and from the races went on late into the night and the grebes were keen to wake us at first light. 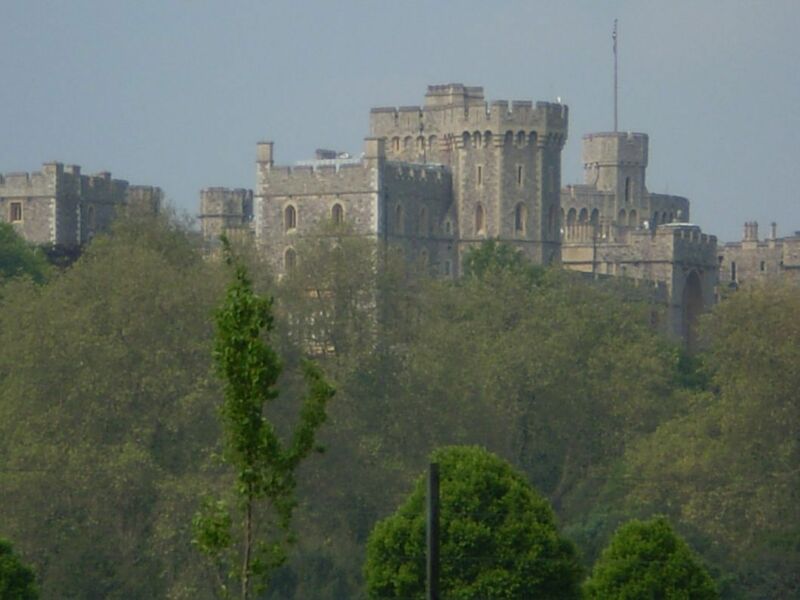 We decided to go into Windsor to get milk and a paper – and found the very quick way to Waitrose – doh! Whilst walking back we spotted the “must have”. A Diamond Jubilee Teddy Bear. 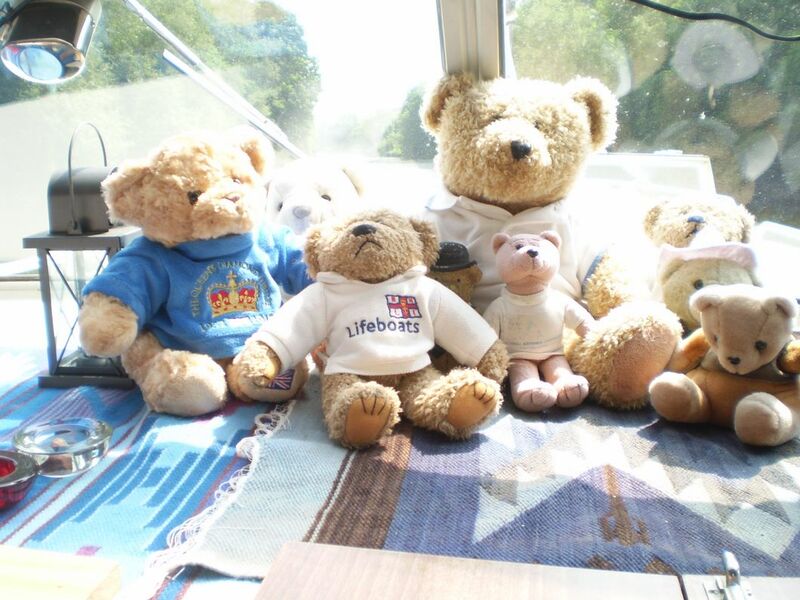 We told the lady in the shop that Teddy would be introduced to the Queen on Sunday and she gave us a discount. How kind was that? We decided to crack on through the locks to our overnight destination without a lunch stop. It was after all only 12 miles or so, about a 3 hour trip. So that is what we did taking the opportunity at the locks to fill those tanks that needed filling ie water and empty those tanks that needed emptying – we’ll leave that to your imagination. 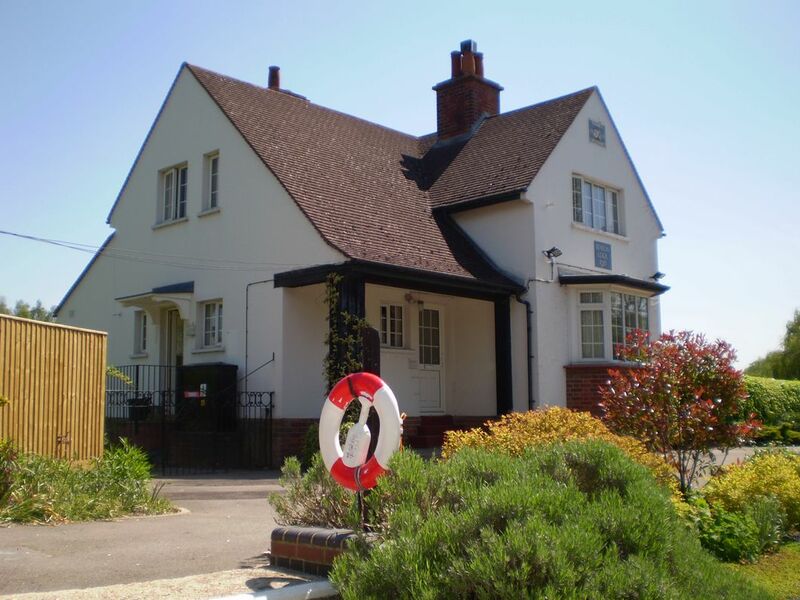 But this part of the river passes through some delightful areas with some lovely houses – including one once owned by Richard Dimbleby, the blue plaque proudly on display to the riverside. After a very pleasant cruise we are moored on “Lady Lindsay’s Lawn” at Old Shepperton. It is a large meadow and wood now set available for public use given to the town by Lady Lyndsay. It was here that Paul managed to find us, having driven from Wendover to Shefford then around the M25 & A30. He had very kindly offered to collect our pageant boarding passes which arrived in the post after we left home. We were very grateful for this as he also brought Mike’s cufflinks to wear with his smart outfit on Sunday. We enjoyed a quick meal together – sausage and mash, followed by strawberries and cream – on board before his trip back home. Thanks again Paul! So the big day has come. We had a good night’s sleep tied to our 2 mooring buoys fore and aft alongside/rafted to a fellow participant using the same buoys. We did have plenty of time until our start at 2.30pm. So we enjoyed a full english cooked breakfast on board with a nice cup of tea. But first, at 7.00am, Mel was interviewed by Radio Derby over the phone to tell of her adventure. She had previously been interviewed by the local press and her story and picture was in the local Derby News. 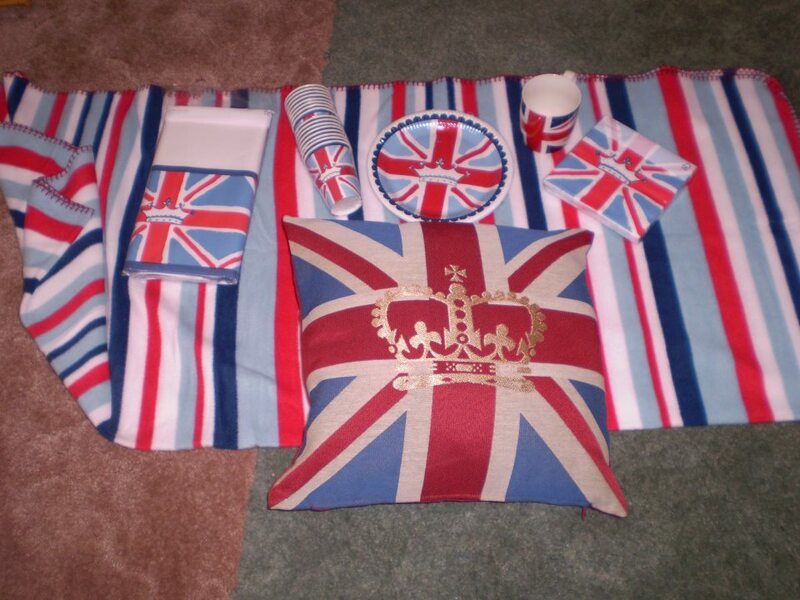 After breakfast we put the final touches to the decorations with red, white and blue throws across the cockpit seats and several Diamond Jubilee cushions. We were determined to keep the back open and the canopy off – which we did, but it was to get very wet. 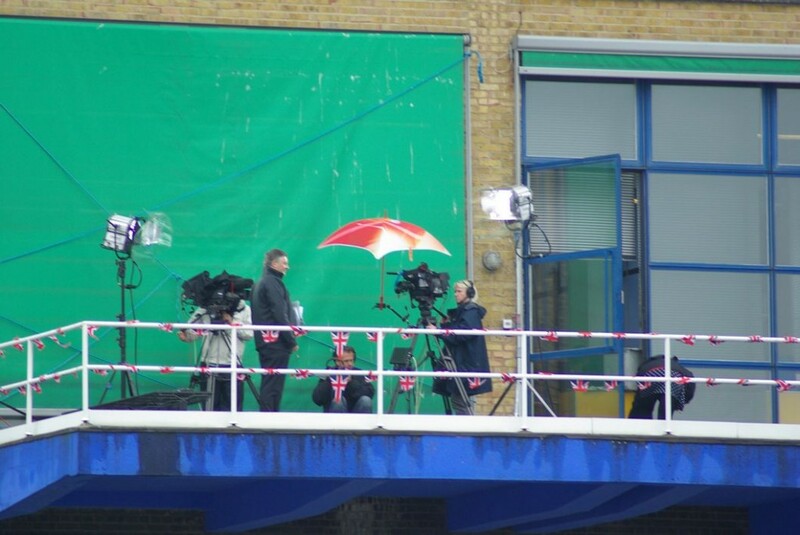 Our mooring, in the middle of the river, was immediately adjacent to the building from which BBC Breakfast and BBC News was being broadcast. 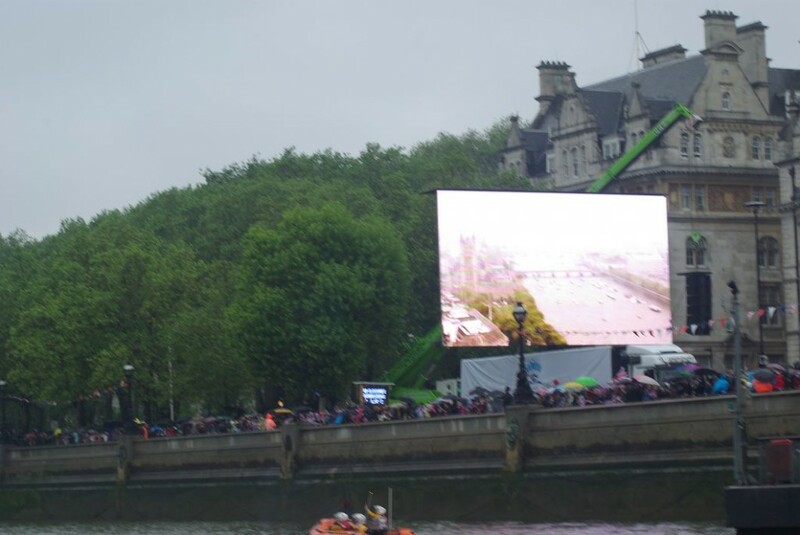 So we watched the presenters who were filming from a balcony overlooking the river, and the interviews taking place with our boats as a backdrop to the morning coverage which we were watching on TV. Sadly, we didn’t get a mention and by the start – at 2.30 – the BBC had long gone from this location. It transpired that the BBC coverage was rather controversial with no mention at all during the day of the Recreational Motorboat Squadron (RMS). Perhaps they didn’t spot any of the celebs or VIPs aboard the recreational boats. As well as some well known TV faces, there were 5 Lord Lieutenants as well as the Kenyan High Commissioner taking part on various boats in the RMS. Timing for the start was critical. 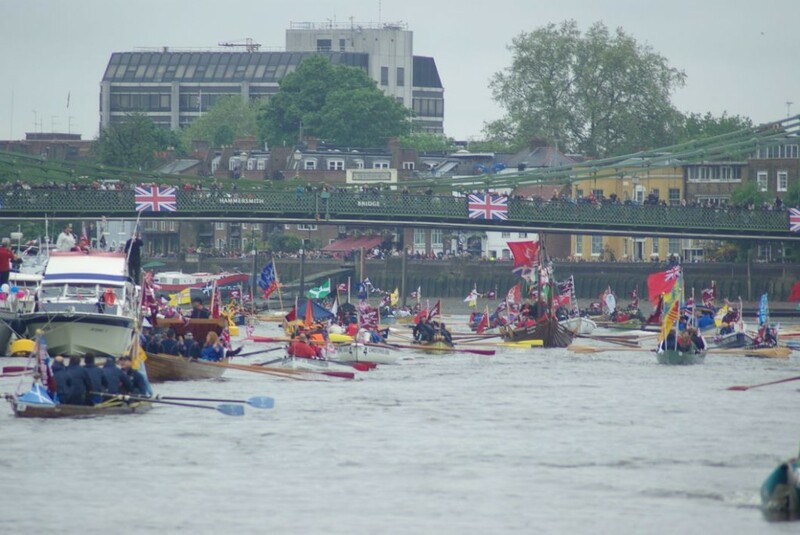 Imagine lots of different groups of boats, starting at different places on the river forming up in a convoy in the right order so that by Albert Bridge the “flotilla” was formed and moving at 4 knots. Mostly, it worked although there were times when it was like the M25 – mad dash at speed then all come to a complete stop. The order to slip moorings was given over the VHF radio and I have to say that from our position on the river it all seemed to go like clockwork. We slip our mooring and we are off! Once we got under way, the enormity of the event became apparent. Even at the start there were crowds lining the bank, and as we got closer to the centre of London the noise of cheering just got louder and louder. We could see a multitude of large screens on the banks and in the parks showing the TV feeds of the pageant and the many parties going on. The highlight had to be going past the royal barge just before Tower Bridge where HM The Queen was taking the salute with many of her family, including of course the Duke of Edinburgh, with her. Through Tower Bridge and that was it 🙂 Well of course it wasn’t. 1000 boats can’t just stop on the other side of the bridge. 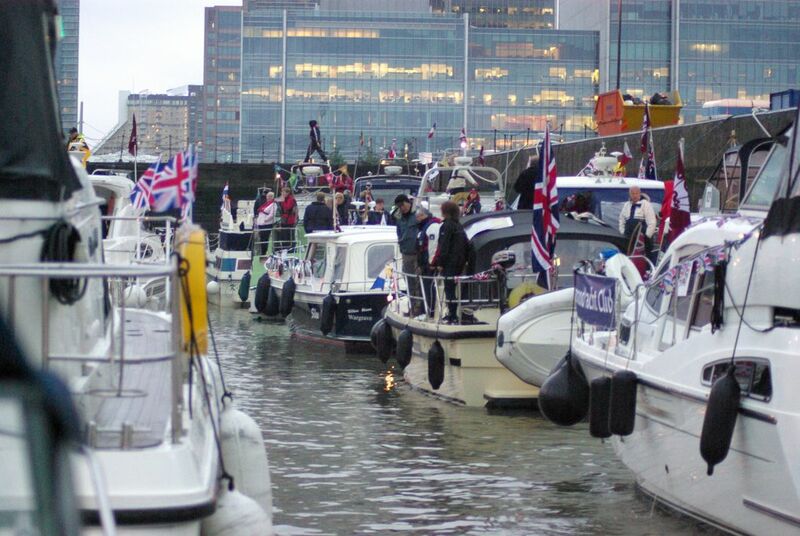 Our mooring for the night was back in West India Dock along with several hundred other boats. To get into the dock you have to go through a lock, which has a turn round time of around 40 minutes. We were booked into the second lock-in. However, events over took us. Some may have noticed that it was raining for some of the time. Well, let’s be fair; it chucked it down for much of the day. By the time we got to Tower Bridge we were pretty cold and wet. But for those in open boats it was getting problematic with the rain getting heavier and the temperature dropping as the evening approached. Several boats had to call for the RNLI lifeboats to attend to passengers with hypothermia so the sensible decision was taken to get “open” boats into the locks first. This meant that we were relegated to the third lock-in. 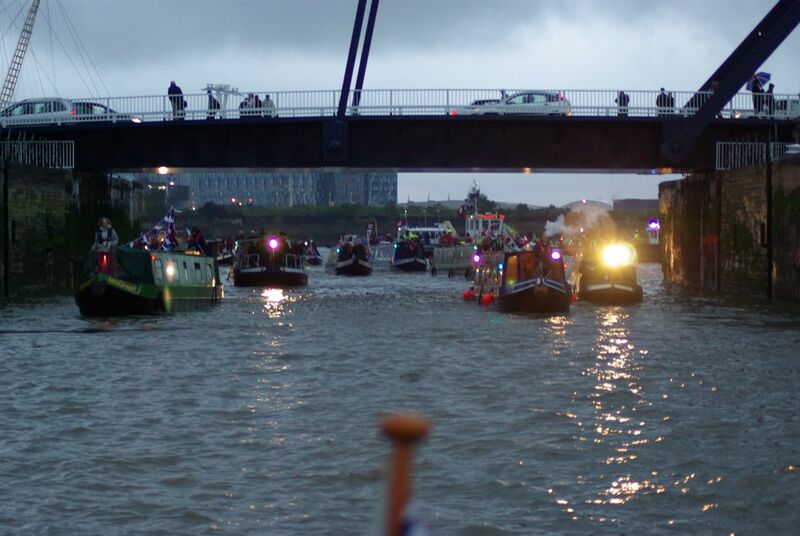 By now as boats continued to arrive, boats were bunching at the entrance to West India lock (opposite the O2 arena) so the PLA again made a sensible decision taking the flotilla on a magical mystery tour. So with the harbour master in the lead we went down to the Thames Barrier (very nice) turned around and went back up river to Greenwich, turned around and did it again. Several times. But eventually it was our turn to lock in. Now to give an idea of the size of the lock at West India, we got 50 recreational motorboats (including several 40-50 foot boats) and 40 narrowboats all in the lock together. Yes it’s a big lock! 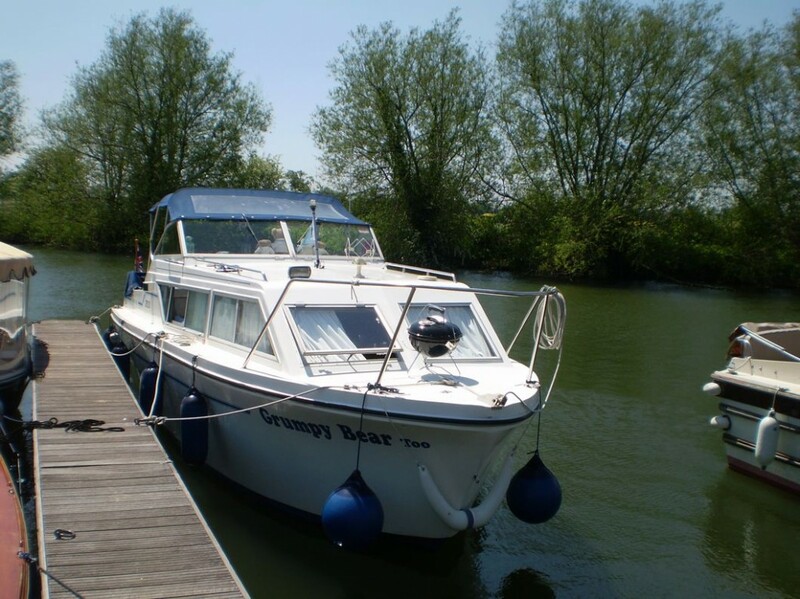 So it was not until 9.30 pm that Grumpy Bear Too was safely moored up, we could relax and break open much needed gin and rum and cider. The London Ambulance Service did a fantastic job too; as all boats coming into the lock were asked if they had any crew with medical problems including hypothermia to make themselves known immediately for treatment. There were 8 ambulances present and 49 people were treated for Hypothermia. But it was an absolutely brilliant day and we would not have missed it for the world. The transition of the Human mind from uncertainty to Knowing, is an important journey in itself. There are so many Truths for certain levels of that particular journey, that will change, until One is left with the one Truth that is accepted in their mind, in their body and fully in their Heart. What One may consider a misconception, another may believe it as an ultimate Truth, this is all part of the journey, weeding out what no longer serves and being able to openly change One’s perspective as Higher resonating Truths enter their fields of Knowledge. best replica designer bags Next month, the Vehicle Excise Duty, or road tax, charged on new diesel cars will rise. For bigger cars, it could increase the price by up to 500. Smaller diesels will see a more modest increase. Bi Level: A replica bags us bi level style home is typically a one story floor plan that has been raised above ground level, where another level of living such as a basement or additional rooms resides. They are often considered ranches or split level homes. In fact, when you enter the front door and have to climb stairs to get to https://www.luxurysreplicabag.com the kitchen or main living space, you typically in a bi level style home best replica designer bags. cheap jordan 12 shoes What changed between ’88 and ’16? “The behavior was worse under Donald Trump,” Jacobs said. “But the context and environment has profoundly shifted.” Jacobs continued his comparison of the eras by saying that in the 1980s, about 15 20 percent of voters “floated between parties.” Today, he added, that’s rare. “We’ve crossed the Rubicon: The conduct from a candidate has cheap jordans sale taken a back seat to their party ID.” Trump, Jacobs concluded, “was spared the harsh rebuke because of his political ID; his voters stood behind him.” cheap jordan 12 shoes. If resistance gets to be too hard, try to reduce the amount of time you spend on your ritual. Each time you expose yourself to your trigger, your anxiety should lessen and you start to realize that you have more control (and less to fear) than you cheap jordans shoes think.Anticipate OCD urges. By anticipating your compulsive urges before they arise, you can help to cheap jordans sale ease them. Overall it a rosy picture. As a group, well clear of the More Bonuses cheap jordans trainers league medians of.555 points percentage (don ask) and the more mathematically reliable dead even goal differential. Four of the seven solidly in playoff position, indeed in the top quartile of the league. Calcium, along with cholesterol, is one of the substances that contributes to the hardening and narrowing of arteries (atherosclerosis). For reasons that remain unclear, when calcium cheap jordans 35 dollars levels spike suddenly, the calcium appears more likely to end up in plaques that line artery walls, a major culprit in heart attacks. The new study, known as an observational study, is the first of its kind to look at the link between calcium supplements and heart attacks, and it has several important blind spots that will need to be explored cheap nike shoes in future research. Rules like: you can sit here and write, cheap jordans 45 dollars or you can sit here and do nothing. But you can sit here and do anything else. You not allowed to do anything else other than sit round, staring out the window. Two company. The first thing to consider when constructing housing is the maximum number of goats you will have at one time. All the goats need enough space to lounge about without being trampled on. Survivors include two sons, Scott Page (Carola), Stuttgart, Germany and Robert A. Page (Monissa), St. Helena Island, SC; a daughter, Michelle Bosworth, Topeka; one step daughter, Virginia Hood (Pat), Leavenworth; a brother, Dwight Page (Keiko), Los Angeles, CA; a sister, Pat Fleeman, Colorado Springs; thirteen grandchildren and many great grandchildren. When there’s a will there’s cheap jordans mens size 11 a way 3. Trust not a new friend or enemy 4. A journey of a thousand miles starts with a single step Meanings: 1. [Editor’s Note:] Just a reminder to our readers that the Bronx News Network is in the middle of our annual fundraising appeal. If you value quality local journalism, please consider donating so we can continue to bring you news and cheap jordans online features, like our daily roundup or our borough events calendar. More details on how to contribute can be found here.. This is cheap jordans 11 low because they are pocket friendly, portable, and find uses for everyone. There is a diverse range of superb printed pens available in the market. Plastic promotional pens are printed easily with your https://www.cheapjordanshoessaless.com business logo, information, slogan and name. The hospice team cheap kid jordans for sale will also refer your loved ones to medical or other professional care if necessary.When is it time for hospice and palliative care?If you are cheap jordans for sale currently benefiting from treatments intended to cure your illness, then cheap air jordan there’s no reason to consider hospice care. And while palliative care can be useful at any stage of an illness, including in alliance with curative treatment, for some terminally Cheap jordans ill patients, there comes a point when curative treatment is no longer working. Continued attempts at treatment may even be harmful, or in some cases treatment might provide cheap jordans size 6 another few weeks or months of life, but will make you feel too ill to enjoy that time. This way you can gauge when its time to refill your cartridges. You must refill before they run out of ink or you will burn out the print heads and have to replace them. The newer Hewlett Packard printers have included in the software that comes with their printers, a “toolbox” that cheap Air max shoes includes a section called Estimated Ink Level. 6. I want to see a cheap real jordans free shipping player surprise us. I don’t have anyone in particular in mind, but I want someone to come seemingly cheap jordans website out of nowhere and have an All Star type season that adds a bit of unexpected fun to the 2018 campaign. And this winter is coming on quickly. Satellite images show the ice has already refrozen around the broken pieces and expanded. In fact the ice is returning so cheap cheap air force kids jordans fast, it is running an amazing 60% ahead (4.0 vs 2.5 million square km extent) of last year when it set a new record. Well, in the books and movies, it makes cheap jordans 14 it clear that the ring itself corrupts the wearer. cheap jordan sneakers So, before the wearer is corrupted, I assume yes. After, no chance. Upon learning that his mother was going blind, he then decided to study medicine (ophthalmology) in the University of Santo Tomas, but did not complete it because he felt that Filipinos were being discriminated by the Dominicans who operated the University. Against his father’s wishes, he traveled to Madrid and studied medicine at the Universidad Central de Madrid where he earned the degree, Licentiate in Medicine. His education cheap jordans from china continued at the cheap jordans 2015 University of Paris and the University of Heidelberg where he earned a second doctorate. It would add nothing to the plot. We already know that they are planning to be married, and in the next scene Romeo acts atypically while saying things which show that they did indeed marry. It might be spectacular but it does not push cheap jordans free shipping the plot forward. Once you have learned the rules of making a cup of tea, and assuming you have the necessary equipment and ingredients, it’s cheap jordans from china easy; so with other cases. If your magic doesn’t work, either you haven’t got the necessary Will, or you are using the wrong ingredients, or the wrong recipe. There’s plenty of stuff published. Parents before getting the summer blues, make sure to check out some of the great Day Camps that Long island has to offer! With many different day camp options, there are limitless possibilities. Whether your child is into science, the great outdoors, sailing, crafting, or you are just looking for a well rounded cheap Air max shoes day camp experience, there are dozens of different options right here on Long Island. You can put your mind at ease knowing your child is being supervised by trained specialists who will provide quality care and entertainment during the day. Multiple firefighters told me that it’s standard, but unwritten, policy in the department to treat the where can i buy cheap jordans scenes of fires in wealthier and whiter real retros for cheap neighborhoods more carefully than those in poorer brown and black ones. In the likes of West Little Rock, Hillcrest and the Heights, after firefighters clear a house of people or cheap jordans retro 13 pets, if they’re able, they’ll search for antique furniture, fine china or other valuables and do what cheap jordans on sale they can to protect it from water or smoke damage cheap jordans for sale by removing it or covering it with a tarp or visqueen. In poorer neighborhoods, belongings are more likely to get destroyed in the course of firefighting.. Downtown Raleigh is no stranger to the traditional alley cat race which sends rides around the city navigating to nine cheap air jordan shoes different locations, gathering clues and checkmarks at each site. The goal is to cheap Cheap jordans jordans under 100 dollars be the first cyclist to check in to all nine spots. For the Hopscotch Hepcat, all of the locations will focus on Raleigh history, art, music and cycling culture. The matter remains controversial, as Serbia still claims the region and recognizes it as an autonomous region controlled by the UN within Serbia’s borders. Neighboring countries Albania, Macedonia, and Montenegro all recognize the independence of Kosovo. The Republic of Kosovo is recognized by 70 member states of the United Nations (but not recognized by at least that number). Here’s what the chair of the City Planning cheap jordans xx9 Commission had to say about her vote: Company’s proposal to redevelop the Kingsbridge Armory represents the most significant private investment in the northwest Bronx in generations. 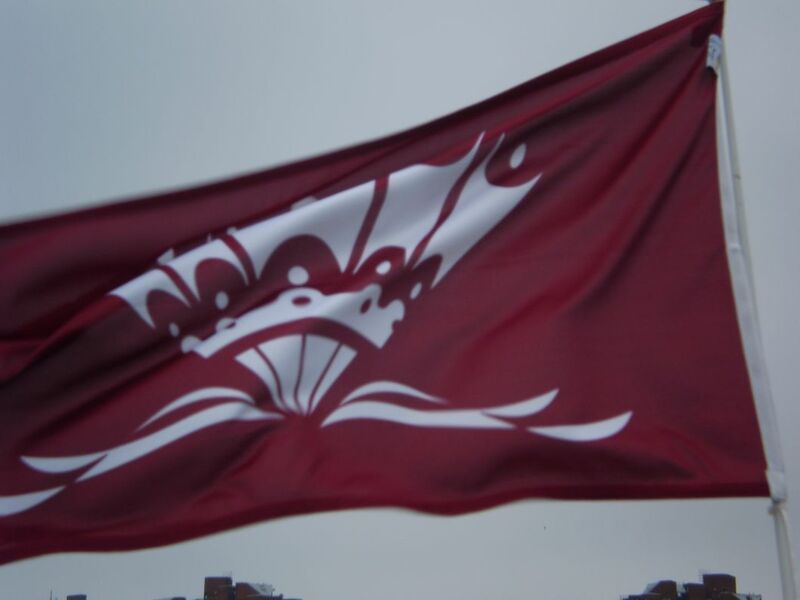 The plan provides an important opportunity to reactivate a unique asset that has been vacant for the past 15 years and to bring jobs, needed services cheap https://www.cheapjordansmds.com jordans paypal accepted and retail to a dense, transit rich part of the Bronx. The plan was developed closely with the community and elected officials as part of Mayor Bloomberg’s Kingsbridge Armory Task Force.. These include white bread, pizza dough, pasta, pastries, white flour, white rice, and many breakfast cereals. They cheap jordan 11 shoes digest quickly and their high cheap jordan shoe sites glycemic index causes unhealthy spikes in blood sugar levels.When you eat refined carbs, your bloodstream is flooded with sugar which triggers a surge of insulin to clear the cheap jordans 20 dollars sugar from your blood. All this insulin can leave you feeling hungry soon after a meal, often craving more sugary carbs. Yes. The most common cheap jordans manufacturer china way to transfer ownership of land is by deed. Yes. Grade 12: Jarrett James Albanese, Quinten cheap jordans sale A. Boehme, Nicholas W. Boltash, Cassandra E. “They have tremendous athletes,” Green Knights head coach Paul Reduzzi said. “They have kids that make great plays cheap nike shoes in space. Phil does a great cheap jordans kid sizes job with his offense. Banco: Bank, where you keep money. Banco: A bench, to sit. Banco: Banco de peces; a fish tank. Pottery use by early Holocene hunter gatherers of the Korean peninsula closely linked with the exploitation of marine resourcesShoda, S., Lucquin, A., Ahn, J. H., Hwang, cheap adidas C. J.
Glendors Bland, Ann 1 Karr, rarrio Bands? Mrs. Mrs. navigate here J Adaline Hiscr, Mrs. First open the cage. Have patience with your rabbit and let him come to you. Don’t tempt your rabbit with food all the time. Woori Bank is a leading Asian bank and the oldest of its kind in the RoK with cheap air force 119 years of operation and 410 branches in 25 nations. PJICO is a member of Petrolimex with 23 years of establishment and development. VNA [Read more.] about Vietnam non life cheap yeezys insurance company partners with Korean bank..
A rail gun is a futuristic weapon that uses a pair of electromagnetic rails to fire bullets at amazing velocities. The US Navy used an experimental rail gun to fire a seven pound projectile at Mach 7. The technology can also be used to launch payload into space. best replica bags online First started when I was single, says Gita, 26. Felt left out of sexting because I had replica nappy bags no one to send nudes to. It a way for me to show my friends how good I look naked because I seriously do right now. Yo! Had a spinal fusion 10 years ago, balance was super hard for me because of my weak core strength. I went to a physiotherapist specializing in spines and scoliosis about a year replica bags nancy ago because some torsion in my scapula had become more pronounced. replica bags india I had some anterior pelvic tilt going on zeal replica bags as well best replica bags online. cheap jordans free shipping GROSS: So “Green Grow The Lilacs,” the play that “Oklahoma!” was adapted from, was written in France by a 29 year old gay cowboy turned poet and playwright who was from Oklahoma. And you say he was trying in that play to capture his nostalgic feelings about growing up in Oklahoma before it was a state. So Hammerstein worked the stage directions into his lyric for “Oh, What A Beautiful Morning,” which is one of the songs from “Oklahoma!” Would you read the stage directions? And then we’ll hear the song cheap jordans free shipping. Landrace single. Dr. R. It is money that can be used by a beneficiary, but is not controlled by the beneficiary. Instead, there is a trustee who follows the rules established when the account was first set up. For example, someone might set up a trust fund for a grandchild that says it can only be used for education until age 30, after which they get full access.. I consider myself a fairly good person. I know I have flaws, but I’m okay with that. My main thing is music. Blue eyes are jordan retro 12 cheap most common in Northern Europe and due to emigration from this area there are people with blue eyes in many other regions of cheap jordans online the world. Researchers were able to find which base pair was common in all individuals with blue eyes and light hair and not in the brown eyed and dark haired individuals. This change is what caused the iris to make less melanin, giving their eyes the lighter color. Johnson most recently served as assistant director at The Bridge to Hope, a domestic violence and sexual assault agency in Menomonie. She has a bachelor degree in sociology with a minor in criminal justice from the University of Wisconsin LaCrosse. cheap good jordans visit this site In her new role, Johnson will be responsible for day cheap air jordan to day program cheap jordans from china operations and staff supervision. She is one of the most admirably honest people that I have known. As in the first answer, if you need to soften your no, say “I’m sorry, I can’t”, and be done with it. If the other person wants to argue, just look at them and say nothing. One of them, Bill Richardson, cheap adidas wrote me this email: “I have get jordans cheap been doing family history research for several years. One of my uncles married a Veltrie in 1939, but tragically both he and his wife died in a house fire in 1940. I was born in 1958 so I never met them and had only a tiny bit of information. The capability of cheap jordans for sale Mir to be expanded with add on modules meant that each could be designed with a specific purpose in mind, thus eliminating the need to install all the station’s equipment in one module. After construction was finished, Mir had a collection of facilities. At 13.1 meters (43 feet) long, the “core” module of the station was the main area where the cosmonauts and astronauts did their work. Samsung Galaxy S10 series launch is just hours away, and the three variants will go up for pre order in many regions starting February 22. According to the latest round of leaks, pre orders in Indonesia will entitle users to get a free Galaxy Watch, Samsung Smart TV, or free Galaxy Buds. If that wasn’t enough, Samsung will also offer cashback, no cost EMI options up to 24 months, and a bundled 40GB data plan as well. The Nexus One built in cheap Air max shoes voice search is definitely wonderful while the voice to text capability is simply a great execution of something we long dreamed of. And with this voice recognition feature, the Nexus One integrates fully with Google Voice. If you a Google Voice account holder, this is very useful. A switch might look similar to a hub but functionally, cheap air force it is very different and much more advanced, so don get confused.Routers: These are devices that connect two different networks and Routing is nothing but the real cheap jordans websites process of communication between different networks. For example, using a Router, you can connect a Class A Network with a Class C network. A Router can be wired or wireless.WebMaster MessageWelcome to TechNation (India) cheap jordans china The Free KB! Feel free cheap jordans 40 dollars to browse through our website. Featuring glass both on the front and back, the Note 8 is undoubtedly one of the most gorgeous smartphones out there. While the glass back panel gives a glossy look, the down side is you always fear the inadvertent dent or scratch on the panel. I spent most of the days using a case for protecting the back panel. The faux leather on cheap jordans shoes the cups also has a very pleasant feel to it as well as ample padding. Button clicks feel very solid and you get cheap jordans 6.5 used to the control scheme in under a day. The placement of controls is very well thought out. cheap jordans 9 Enfin de toutes faons les retraites risquent d’tre amputes et a n’incite pas s’en soucier. On peut se demander si la gnration montante pourra seulement where to find cheap jordans online atteindre la vieillesse.Cet article est interdit de lecture aux mineurs et aux femmes. Ceusses qui rient quand ils se cheap jordans size 9 womens brlent sont pris de passer directement au cheap jordans size 7 post suivant. Running Android cheap jordans in china cheap air jordans 3 6.0 Marshmallow, the Galaxy J7 Prime comes with Samsung’s own TouchWiz UI layered on top. Over the years, Samsung has worked on its TouchWiz UI and it is now much lighter than it used to be a few years ago. One https://www.cheapjordans13news.com of the biggest changes is the reduction in the amount of bloatware. Basically, telecommunications involves the sending and receiving of information, which can range across a variety of technology such as radio, television, the internet, or even the lowly landlines cheap nike shoes that cheap jordans 2017 review connect people’s homes and offices. However due to the geological features of the Earth, as well as the limitations of the technology themselves, terrestrial based telecommunications will always leave most of us wanting for more. Getting in touch with a family member or a friend is very easy especially during these times. high quality designer replica Alex says yells about a ton of stuff I can agree with, go along with know to be untrue. As a critical thinker, I don need information overlords making decisions for me. I entirely against that concept anyone that is aligned with it. Our grandmothers made it just for holidays, but now we bake it at almost all special occasions. Variations of it are also.96Potato Main Side Dish RecipesHOMEMADE PIEROGI: History, Fun Facts and Gram’s Authentic Recipeby Sharon Smith 5 years agoThere’s nothing more authentic than homemade pierogi. If you’ve never tried them, you must! Here you will find interesting history, fun facts and authentic recipes to enjoy!How to Make a Louisiana Gumbo (for just a few or for 50! )by Michal 13 months agoHere is a recipe for the best gumbo ever by a Louisiana Cajun high quality designer replica. replica bags Investigators were looking into an online video that appeared to capture the scene right before the shooting began, Williams said. replica bags karachi A red dot that appears to be a laser pointer is visible on the chest of a player seconds before the first of about a dozen gunshots rings out. On what had begun as a quiet Sunday replica bags wholesale hong kong afternoon replica bags. replica bags online Torque fuel rail to intake manifold to 25 Nm n5. Replace sealing ring between throttle valve assembly and intake manifold n6. Torque throttle valve assembly to intake manifold to 9 Nm n7. Trump has been fuming about the probe in recent weeks as he has been informed about the legal questions that he and his family could face. best replica bags online 2018 His primary frustration centers on why allegations that his campaign coordinated with Russia should spread into scrutinizing many years of Trump dealmaking. He has told aides he was especially disturbed after learning Mueller would be able to access several years of his tax returns replica bags online.